Many times I have looked back over my writing and noticed too late that I had made an embarrassing spelling or word usage error. My writing style of "get it right the first time" is prone to that sort of mistake. But fortunately, the blog medium allows for incredibly easy retroactive correction. However, if I was writing my blog on say...giant stone tablets in a very public place...you better believe my writing style would adapt quickly to include a thorough and careful proofreading step. Which is why, despite my editorial failings, I cannot help but revel in the schadenfreude over Oklahoma's new Ten Commandments monument. Apparently Rep. Mike Ritze (R)(surprise surprise), who sponsored bill erecting the 2000 lb monument, was in such a hurry to defy the First Amendment that he forgot to even use spellcheck. What could be a better metaphor for the constitutional illiteracy required to expect the monument to endure the inevitable lawsuit from the ACLU? 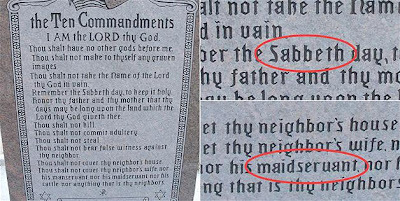 Ten Commandments monuments are nothing new and have become a sort of symbol of the lost traditional America by the religious right. Phrases like "Christian Nation" and "founded on Judeo-christian values" have become commonplace in conservative and even some liberal circles. Moreover when the lawsuit comes down it's portrayed as religious oppression of the Christian majority in this country. Now it's easy to demonstrate that our laws are not "based on the God of the bible and the ten commandments." True, three commandments are codified in our legal system: the prohibitions of murder, theft, and bearing false witness (perjury). Contrary to the claim, however, the first five injunctions are actually blatantly unconstitutional (or would be if we made laws of them). Requiring the worship of Yahweh and no other gods is the antithesis of the religious freedom guaranteed by the first amendment itself; forbidding taking his name in vain is a blasphemy law in violation of free speech. Work on Sunday )or Saturday depending on your choice of Sabbath) is not a capital offense. Parents are not awarded automatic honor. Moreover, the commandments against coveting our neighbors property (which includes his wife BTW) would be devastating to our capitalist society. The free market, which is invariably idolized by erectors of these monuments, is built on demand created by desiring your neighbor's possessions. And on the subject of idolatry, I find a delicious irony in the near deification that ten commandments monuments have received in recent years. 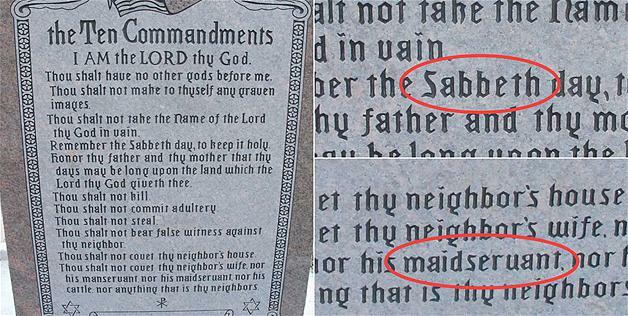 I fully realize that most Americans don't actually know what the ten commandments say, but they should at least realize that venerating a carved stone monument that explicitly prohibits worshiping carved stone monuments is problematic. But still the monuments go up and still the lawsuits push forward. A common response from theists and non-theists to the lawsuits is "Don't we have bigger things to deal with? Why are you atheists so concerned about a little monument or a cross on public land?" Van Orden v. Perry is why. In this supreme court case, a ten commandments monument at the Texas State Capitol was "grandfathered" in because it had been in place for decades. The 5-4 decision set a precedent of "if no one complains about it right away, eventually it becomes legal." If we can learn anything from these ten commandment battles we should learn to make our voices heard. By remaining silent on these seemingly minor issues we establish an atmosphere of indifference to the slow encroachment of religion into our supposedly secular government. Our silence emboldens our enemies, and they have become far too bold already.